Prior to the September provincial election, Quispamsis resident Kathy Kaufield started an online campaign in hopes party leaders would pledge to ensure New Brunswick women are informed about their breast density and the associated cancer risks. Before the September provincial election, Quispamsis resident Kathy Kaufield started an online campaign in hopes party leaders would pledge to ensure New Brunswick women are informed about their breast density and the associated cancer risks. The #TellMe campaign launched Aug. 28, and within two weeks the Progressive Conservatives and the Liberals both promised to make sure that the information would be shared. Within weeks, several provincial governments across Canada committed to reviewing or changing their reporting policies. Those provinces included British Columbia, Prince Edward Island, Saskatchewan and Nova Scotia. Radiologists say dense breast tissue can obscure cancers on a mammogram, but the majority of Canadian women are unlikely to be aware of the risk or their breast density. An estimated 80,000 New Brunswick women have dense breasts, and 18,000 of them would fall into the "highest density" category, where the accuracy of a mammogram is about 50 per cent, according to studies. Advocates say women should be given density information on their mammogram report to be able to seek additional, more effective screening. "A lot of work has been going on behind the scenes before this, but I think that the commitments made by the leaders in New Brunswick really started something," Kaufield said. "I hope it grows and grows until all women across Canada are notified of their breast density, and I'm not going to give up in New Brunswick until that happens." The Progressive Conservative government intends to keep its promise, according to Health Minister Ted Flemming. 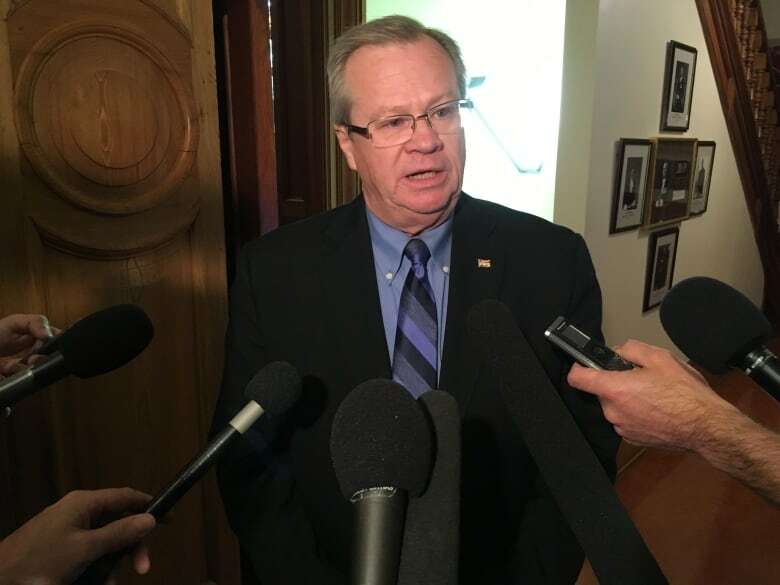 "It's a platform commitment made by Premier Blaine Higgs and we will follow through with it," Flemming said in a statement. "From a policy point of view, we will consult with our stakeholders, such as the regional health authorities and the New Brunswick Medical Society, to work with us on this issue towards implementation." Those consultations began this winter, and Kaufield was one of the stakeholders meeting with the government. She said the meeting was positive and she was pleased to hear the minister's support. But the fight for Kaufield and other proponents of change is far from over. After a fall full of good news, breast cancer and breast density advocates were dealt what they see as a major blow. In early January, the Canadian Task Force on Preventive Health Care updated its breast cancer guideline. Task force guidelines are peer-reviewed recommended best practices for primary-care providers, and they inform roughly 36,000 family doctors across the country. The new breast cancer guideline, an update to the original published in 2011, falls short of the change Kaufield and others hoped for. Describing breast density as an "emerging risk factor," the task force ultimately didn't associate dense tissue with an increased risk of breast cancer, according to Dr. Ainsley Moore, the vice-chair. Moore, a clinical associate professor at McMaster University, said density is a risk factor but there are many risk factors for breast cancer, including early menstruation, alcohol intake, a sedentary lifestyle and a full-term pregnancy later in life. "They're not considered risk factors that put women at a high risk for breast cancer and breast density is not associated with an increased risk of dying from breast cancer," Moore said. "There are uncertainties here and there are subtleties here." 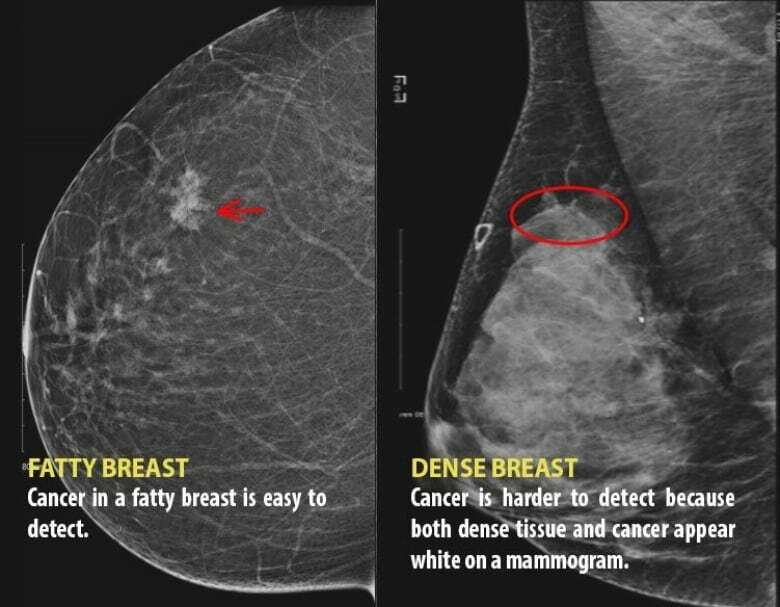 Moore said there is "instability" in how radiologists define and diagnose dense breasts, and there isn't enough "trustworthy" data from randomized control trials to point to an effective screening strategy or suggest a woman's chances of survival are improved by screening one way or another. Dr. Paula Gordon, a breast radiologist and clinical professor at the University of British Columbia, said breast density is far from an emerging risk after decades of studies on the issue and into benefits of additional screening with an ultrasound or MRI. Gordon, a medical adviser to the foundation Dense Breasts Canada, has said ultrasounds on women with dense breasts double the cancer detection rate over mammography. She said the evidence used by the task force in forming its guideline is outdated and based on outdated technology. The task force only considers data from randomized control trials, she said, but there isn't a completed breast density trial. There is a trial going on in Japan, Gordon said, but it could takes years, decades even, before it's finished. The new guideline recommends women aged 50 to 74 undergo mammogram screening every two to three years. For women aged 40 to 49, it recommends against screening with mammography. Moore said the updated guideline now encourages shared decision-making between patient and doctor if there's an interest in being screened. "The task force isn't really telling women what to do here. It's providing the tools for women to make the choice best for them." Those recommendations are based on the balance of benefits (the probability of surviving breast cancer) and harms of screening (false positives and overdiagnosis). False positive harm is the undue stress of something picked up by screening that's ultimately nothing or non-threatening. Overdiagnosis is finding indolent cancers that won't cause death but can lead to unnecessary and harmful treatment. Gordon argued the harms, despite possible physical or emotional pain, do not outweigh the benefit of saving a life. Gordon has been critical about how the task force operates with no oversight as an independent, arm's-length body from Health Canada and wants to see it restructured.